Even though it may not feel like it right now, the spring months are nigh, and we’re hoping they’ll actually bring spring weather along with them. While we’re waiting for the sunshine to roll around, we’ll focus on what we can control, like preparing our skin care and makeup routines for the coming season. Start with these five strategies to get your beauty game in tip-top shape for spring. Eschew rich, creamy formulas in favor of something a little more comfortable—read: seasonally appropriate. A lightweight gel moisturizer like Kiehl’s Ultra Facial Oil-Free Gel Cream ($26.50, kiehls.com) is perfect for skin that tends to err on the side of oily (especially the acne-prone), while a slightly more substantial formulation like Tata Harper Repairative Moisturizer ($100, tataharperskincare.com) is better suited to skin that dries easily even during the warmer months. If you like a heavy dose of hydration but want to avoid the heavy, oily feel of super-rich creams, try layering a hydrating serum, like Caudalie Vinosource S.O.S. Thirst-Quenching Serum ($49, us.caudalie.com), underneath your moisturizer. Out with the old, in with the new… layers of skin, that is. Winter has a way of contributing not only to dryness but also flaky, complexion-dulling buildup that’s crucial to shed come spring. A fruit-based chemical exfoliator or peel like Juice Beauty Green Apple Peel Sensitive ($39, juicebeauty.com) uses natural acids to brighten and rejuvenate, but if you have particularly sensitive skin or you just start experiencing heart palpitations at the first suggestion of the words “acid peel,” a refining exfoliant scrub like Amarte Daily ExfoliPowder ($35, amarteskincare.com) will do the trick. For softer-feeling, smoother-looking skin from head to toe, don’t forget to add a body scrub, like Soap & Glory Flake Away Body Polish ($20, soapandglory.com), into your shower or bath routine. Heavy foundations hide a multitude of sins in the winter months—lack of sleep, surplus of holiday celebrations, and vitamin D deficiency, to name just a few—but as with our moisturizers, spring is high time to make the switch to something lighter, more versatile, and ideally, something that doesn’t need to be applied with a brush every morning. (Who has the time?) For those who need only the lightest of perfecting coverage, Sunday Riley Effortless Breathable Primer ($48, sundayriley.com) is unbeatable. We also love Vichy ProEVEN Mineral BB Cream ($33, vichyusa.com) for its fuller, skin tone-evening coverage. Pro tip: If you’re stricken with blemishes or dark circles, take full advantage of a great concealer rather than load on the full-face spackle. You should be wearing SPF year-round—that’s a fact—but where a lower factor will suffice in the cooler months, it’s now time to bring out the big guns. La Roche-Posay Anthelios 50 Daily Anti-Aging Primer with Sunscreen ($39.99, laroche-posay.us) is absolutely genius, because while the drawback of many sunscreens is their tendency to work poorly underneath makeup, this dry-gel formula is made to be worn under foundation and concealer. If there’s one beauty-related thing to get really excited about for spring, it’s color. Trade out your winter-ready berry and plum lipsticks for brighter shades that pop. Hot pinks, purples, and orange-reds are perfect when worn with fresh, “natural”-looking skin and minimal eye makeup: A touch of mascara is really all you need when you’re wearing a head-turning shade like ILIA Beauty Lipstick in Neon Angel ($26, iliabeauty.com). 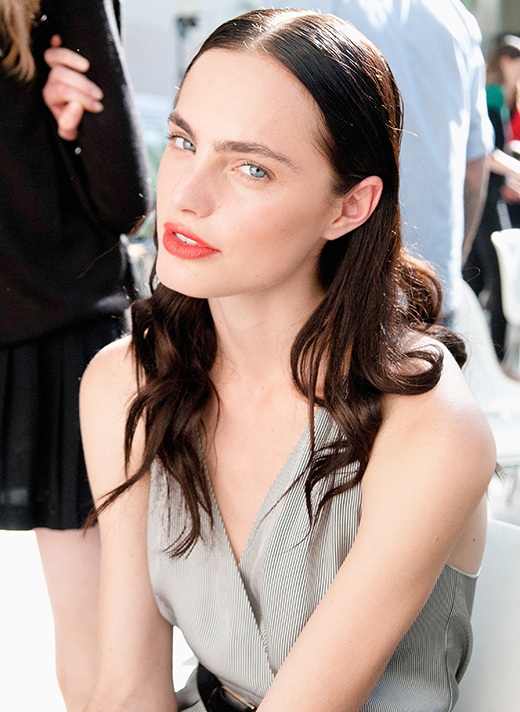 Try something new for cheeks, like a daring bold red cream blush. We love the new MAKE UP FOR EVER HD Blush in 515 ($26, sephora.com)—blended well with your fingertips, the resulting flush is surprisingly wearable.